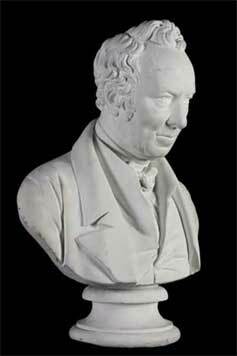 Plaster bust of Thomas Bewick by E.H. Bailey. 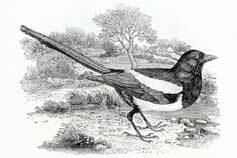 'The Magpie' by Thomas Bewick. 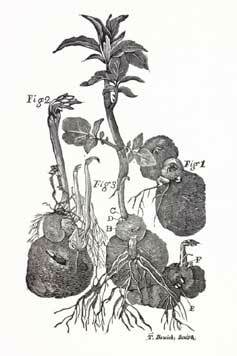 Potato wood-engraving by the Thomas Bewick Workshop. The project is funded by the Heritage Lottery Fund. In many ways the Thomas Bewick collections at the Laing Art Gallery and the City Library are very similar. Both contain unique examples of Bewick's beautiful watercolour studies, his original woodblocks and his copperplates. Both hold first editions of his celebrated natural history books and rare examples of other books illustrated either by Bewick or by his apprentices. Both contain drawings by Bewick and his pupils and important portraits of the master engraver himself. Both contain documentation relating to the workshop accounts, manuscripts and letters from Thomas Bewick to (and from) his family, business contacts (printers, clients, publishers) and personal friends. However, in some areas the collections differ. The Laing Art Gallery's collection boasts several fine Bewick watercolour paintings, including a rare animal study, 'The Royal Tiger'. Among the books, Charles Hutton's 'A Treatise on Mensuration', contains Bewick's first attempts at wood-engraving for book illustration. In the copperplates collection, is the original 'seaweed' design for the receipt he issued to authenticate his work, as well as copperplates engraved by his son, Robert Elliot Bewick. There are many original woodblocks including some used for his early illustrations for children's books. There is a large collection of engravers' tools that would have been used either by Bewick himself or by his workshop apprentices. The Laing's collection is especially rich in the work of his apprentices, in particular Luke Clennell. The Laing also has (although now kept at Tyne & Wear Archives) most of the existing workshop account books which provide an invaluable source of information for students of printing and the book trade in eighteenth century Newcastle. Here, at the Laing, Bewick's work is seen alongside that of his contemporaries. There are many beautiful examples of engraving on metal and enamel-decorated glass by the talented Beilby family. This, together with other equally fine work by the foremost painters, potters, engravers, goldsmiths and silversmiths of the day, is displayed in 'Art on Tyneside', the Gallery's award-winning exhibition, documenting the social history of Newcastle upon Tyne. Newcastle City Library's collection, bequeathed to the City in 1901 by John William Pease, is just as representative of Bewick's work, but it too, has its own special strengths. Letters, engravings, drawings, newspaper cuttings and memorabilia are to be found in important albums compiled by enthusiastic Bewick collectors of the time. Examples of copperplate engravings are to be found in five huge volumes of coal certificates and albums of bookplates. The collection of over 700 woodblocks contains the originals for some of Bewick's finest illustrations, including for Parnell's 'The Hermit' and Goldsmith's 'Deserted Village'. Of particular note, are the rare large Bewick wood-engravings, including 'The Chillingham Bull' and his unfinished 'Waiting for Death'. 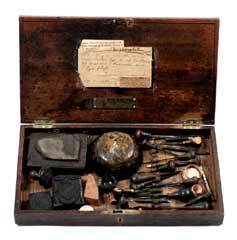 Personal items like the engraver's tool box and table were also included in the bequest. Considerable additions, including books and woodblocks, have been made to the collection since 1901.